Nvidia’s automotive ambitions seemed targeted solely on creating a platform to enable fully autonomous vehicles, notably the robotaxis that so many companies hope to deploy in the coming decade. It turns out that Nvidia has also been working a more near-term product that opens it up to a different segment in the automotive industry. The company announced Monday at CES 2019 that it has launched Nvidia Drive AutoPilot, a reference platform that automakers can use to bring more sophisticated automated driving features into their production vehicles. This is not a self-driving car product, although it will likely be misinterpreted as such. The Drive AutoPilot system is meant to make those advanced driver assistance system in today’s cars even better. It enables highway merging, lane changes, lane splits, pedestrian and cyclist detection, parking assist, and personal mapping as well as in-cabin features like driver monitoring, AI copilot capabilities, and advanced in-cabin visualization of the vehicle’s computer vision system. It also allows for over-the-air software updates, a capability that automakers, with the exception of Tesla, have been slow to adopt. On Monday, Tier 1 suppliers Continental and ZF announced that by 2020 they will have partially automated driving systems ready for production that are based on the Drive AutoPilot platform. Nvidia argues that there’s a market for this improved automation, noting a recent Insurance Institute for Highway Safety study that found existing Level 2 ADAS systems “offer inconsistent vehicle detections and poor ability to stay within lanes on curvy or hilly roads, resulting in a high occurrence of system disengagements where the driver abruptly had to take control.” Level 2 is a designation from SAE that means the vehicle’s automated system can handle accelerating, braking and steering, but must still be monitored by the driver, who should be prepared to take control at any time. Nvidia doesn’t make plug-and-play type systems. Instead, Continental, ZF or other suppliers can take this reference platformand use it to deliver any combination of more advanced automation. For example, Continental will use it to produce an automated driving and parking solution that will be available to customers by 2020. The foundation of the Drive AutoPilot is Nvidia’s Xavier system-on-a-chip processor, which can handle some 30 trillion operations per second. Then it adds Nvidia’s Drive software to process deep neural networks for perception as well as data pouring in from surround camera sensors. 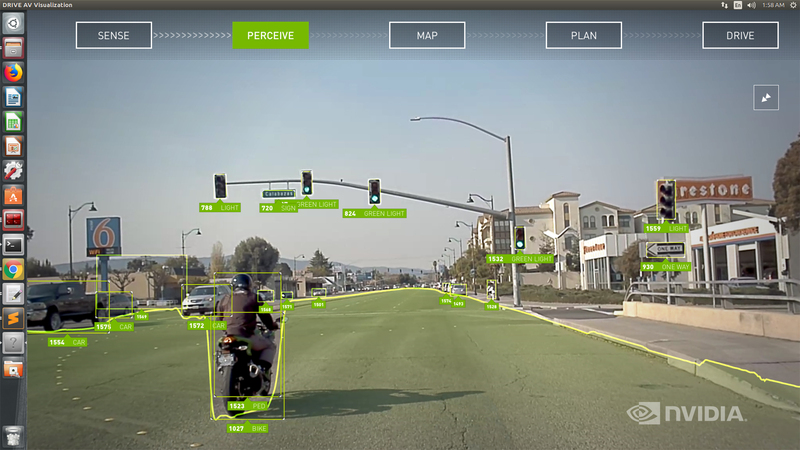 The Drive AutoPilot system is part of Nvidia’s broader Drive platform. It’s also designed to complement the company’s Nvidia Drive AGX Pegasus system that provides Level 5 capabilities for robotaxis. “A full-featured, Level 2+ system requires significantly more computational horsepower and sophisticated software than what is on the road today,” Rob Csongor, vice president of Autonomous Machines at Nvidia said, adding that the company’s system makes it possible for carmakers to quickly deploy advanced autonomous solutions by 2020 and to scale this solution to higher levels of autonomy faster.